Jean Cocteau delivered the first World Theatre Day mes­sage in 1962, and the list of past World Theatre Day mes­sen­gers includes Judi Dench, Vaclav Havel, Peter Brook, Wole Soyinka, Eugene Ion­esco, Ellen Stew­art, Richard Bur­ton, Luchino Vis­conti, Pablo Neruda, Laurence Olivier and Arthur Miller. 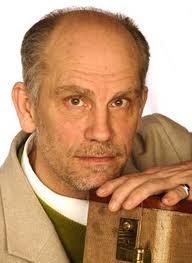 Malkovich is the first American to deliver the said message. Below is the message Malkovich delivers this year at the headquar­ters of UNESCO in Paris on March 22. I'm honored to have been asked by the Inter­na­tional Theatre Insti­tute ITI at UNESCO to give this greet­ing com­mem­or­at­ing the 50th anniversary of World Theatre Day. I will address my brief remarks to my fel­low theatre work­ers, peers and comrades.